Have a liking for any pairing on the popular show and manga, Naruto? Well tell us how you feel about the certain couple and how they could end up together! New to the forums? Stop by the academy to introduce yourself. Want to discuss something in the random sort that isn't stated in the forums? Then this is the place for you! Have another manga you would like to share to the world? Then post here to spread the love. Have another favorite anime series you'd like to discuss? Then post here to tell us about it. Come here to discuss about anything about the Naruto series anime and manga alike such as character discussion, but please remember to put spoiler tags over Manga related stuff. Come here and talk anything about the Naruto anime. ABSOLUTELY NO MANGA SPOILERS! Come here to discuss the recent chapters of the Naruto manga. 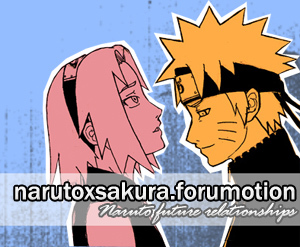 As you can tell from the name of the site you can tell this is a site dedicated to the great pairing known as NaruSaku (Naruto x Sakura). Come here to discuss anything about the pairing and such, like its developments from a one sided love to something more. Have another favorite pairing besides NaruSaku? Then you're in luck! This forum is for you! Have any pictures, graphics, colorings, fanfics, and AMVs you want to show off? Or maybe you want to write tutorials to help fellow members to unleash their artistic potential? This forum serves that purpose. Come here to discuss current and soon to be released video games. Discuss anything related to world of technology. Come here to create and manage your own GFX shop/Organization. You may also post requests for an Avatar, sig, etc. Your day in the life of a ninja starts here. Relax and get ready to set off for the day ahead! Come on in to have a steamy bowl of hot, declicious ramen. Learn the ways of ninja as well as teach the academy students to help them along their way to the ninja path. Train to become stronger with your fellow Ninjas or clash in friendly competitions. The Kage of the village has summoned you for a mission. Your job is to make sure it's successful. Announcement and Updates of the forums are posted here. Have a suggestion to make a forum better? Then post here so we can improve and make the forum better for all. Have a question about the forums? Post here and we'll get back to you as soon as we can.